Endorphin Dude lives by the fiscal calendar, not so much because he is fiscal role model, but because his first long distance race happened at the beginning of the fiscal year. 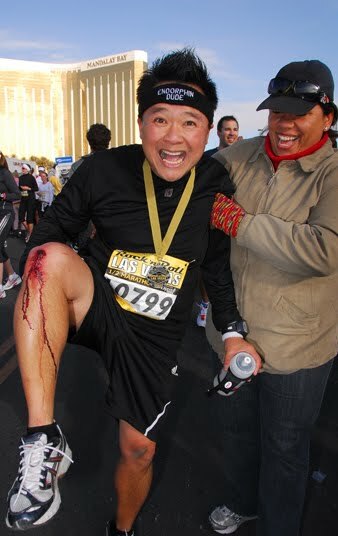 Happy Endorphin New Year peeps! 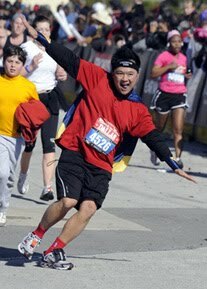 On October 4, 2009, your Marathon Caped Crusader ran his first half marathon at the San Jose Rock 'N' Roll Half Marathon. I remember it like yesterday. The butterflies in my stomach mutated into bats, and they all fought to break free. To say that nerves got the best of me would be a gross understatement. 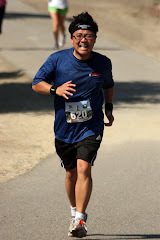 Thankfully, the excitement of my inaugural 13.1 foot race helped alleviate the anxiety, and once I got into it, I ran strong and crossed that half marathon with a very impressive 2:15:15 finish. That was pre-E-Dude. 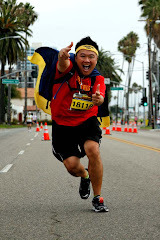 These days, I am a 2:45-3:00 and beyond half marathon finisher because I prefer to get out there and have fun. 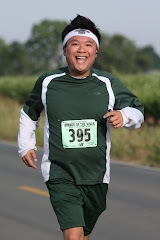 I like stopping at every mile marker and cheering on the runners and walkers who zoom past me. I like stopping at aid stations and chilling out with the volunteers. I look stopping for photo shoots along the course. I have nothing to prove to anyone, so the PR for me is the party race and not the personal record. You gotta love the volunteers! 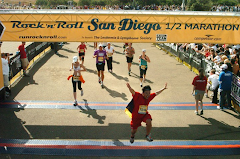 The San Jose Rock 'N' Roll Half marathon is my favorite 13.1 miler for very sentimental reasons. Not only was it my first long distance race, but it also marked my sister Diane's first race as well. 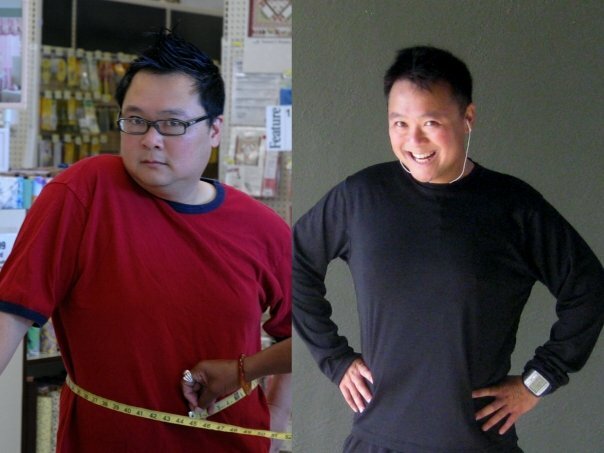 Diane had been going through some rough patches over the past few years and as a result she gained some pounds and lost some self-confidence. I registered her for San Jose for her birthday and told her that if she didn't show up on race day she would owe me 100 bucks. Sure enough, she trained for it, showed up, and accomplished her goal of completing 13.1 miles within the four hour time limit. Runner's high hit her hard and she vowed to get in better shape and improve her time. 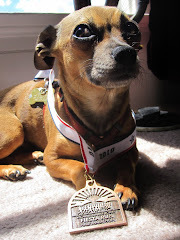 Over the next year, she completed three more half marathons, each time significantly improving her time. 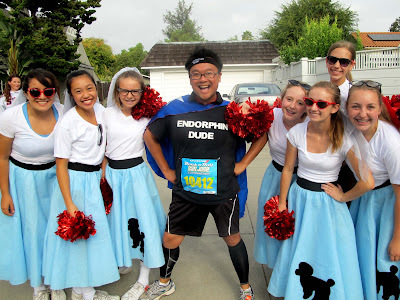 She qualified for Half Fanatics at Brazen's Hellyer Half Marathon in May and continued to train non-stop ever since. All that work paid off. 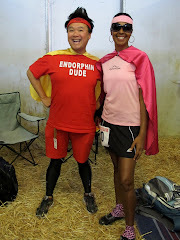 I have a hunch Diane and I will be running this race together for the rest of our lives. I'm sending healing vibes to your foot, you're so close to the big magilla! Thanks again for keeping me company in Lake Tahoe. I'll be picking up my Rock Idol medal in Vegas, you gave me the kick in the pants to get it done. 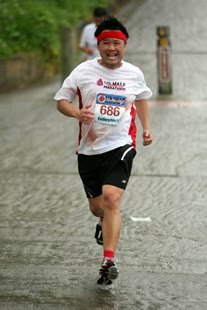 I also took your advice to enter a timed race, in preparation for my 50 miler in April. I'll be at ATY to do the 24 hour on Dec 31. Sounds like we're doing different days. That's a shame, I'd love to get more advice from the caped cruiser. I'll look for you in Vegas, good luck with your triple this weekend.